It's been a labor of love, and it has been labor! It's very difficult to express adequately the importance of the years of dedicated work that Katherine Wells has donated to the people of New Mexico. Katherine was born and grew up in Kansas City, MO. She graduated with Honors from the University of Wyoming, traveled and studied in Venezuela on a Fulbright grant, attended the Otis Art Institute, the University of Southern California, California State University at Los Angeles, and University of California at Riverside in the early '60s. She taught high school English, Spanish and English as a Second Language until 1974 in Montclair, CA. She then, with her good friend Jean Gillingswators, ran a silk-screen business for ten years. The project has benefited greatly from her graphic design experience. In 1992 Katherine moved to New Mexico and, with her partner Lloyd, purchased 188 acres that turned out to have possibly 9,000 petroglyphs on it. The next year, Katherine participated, with Ginger, her devoted canine hiking partner, in the recording of her petroglyphs by the Archaeological Society of New Mexico's Rock Art Field School, under Jay and Helen Crotty. The importance of this concentration of images prompted her in 2007 to donate 156 of those acres to The Archaeological Conservancy, for their perpetual protection. This donation became the Wells Petroglyph Preserve. Katherine's amazing stewardship of her small part of Mesa Prieta was rewarded by the American Rock Art Research Association: in 2005 she was presented with their Conservation and Preservation Award. As a founding member of Vecinos del Rio, a local grassroots organization formed to deter destructive mining above the Preserve and elsewhere in the area, Katherine felt that the organization should take on a more positive project - that of protecting Mesa Prieta petroglyphs and informing the public about their importance. In 1999 she created the Mesa Prieta Petroglyph Project and was its Chair until this year, when she stepped down after more than 13 years of leadership. Her view that preservation will only happen through education has become the widely recognized hallmark of our project's very successful work over the years. In 2008, MPPP received the first Education Award from the American Rock Art Research Association. In 2011, we were presented with the national Take Pride in America Award for outstanding public-private partnership with the Bureau of Land Management. Katherine has often been frustrated by the conflict between her selfless devotion to the project and her need to contemplate, interpret and express her inner self as a mixed-media artist and author. She has had 20 solo exhibitions of her iconographical work across the United States. She has also written a memoir, Life on the Rocks: One Woman’s Adventures in Petroglyph Preservation, which was published by the University of New Mexico Press in 2009. She yearns to be back in her studio. In the very beginning, Katherine wished that not only the petroglyphs, but all the other evidence of human activity on Mesa Prieta over the last 10,000 years, could be recorded. That wish is coming true. Our Recording Coordinator, Candie Borduin, has dedicated herself to training our wonderful volunteer recorders mercilessly in her quest to have the best and most comprehensive cultural landscape survey records in the state. We now record all the archaeological features we recognize on the Mesa. We are also at long last beginning to address Katherine's other wish, expressed at the end of her book: that one day we will deliver the “whole enchilada” to the state Archaeological Records Management Section, or ARMS. In the very near future, we will be applying for 16 New Mexico Cultural Resource Information System, or NMCRIS, “Activity Area” designations which will correspond to what we refer to as Projects, or landowner parcels. This is the first step in a long process of achieving Katherine's enchilada delivery. When the bells ring out, we will all rejoice! Founder, Guardian, Visionary: Katherine Wells truly is. According to his friend and colleague, Will Dearholt, our Bob K. Greene works up at Los Alamos National Laboratory doing post-simulation data visualization and processing and makes amazing movies of the work done in his department. Many of his movies have been shown to very high-level visitors to the lab, possibly including President Obama. He is also very generous with his time, often going to people's offices to help them view their data and show alternative methods of considering their computer simulations and results. He is a real asset to the LANL group. 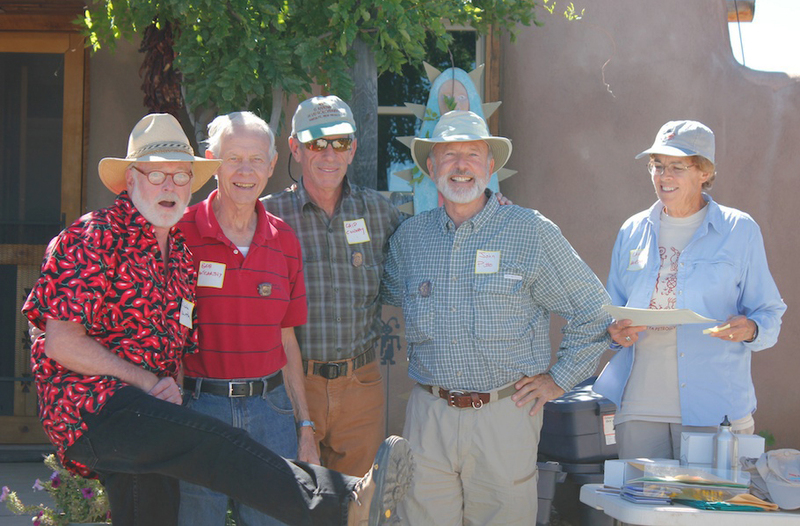 Bob has also been a site steward for the Santa Fe National Forest for about eight years. When he was living in Los Alamos, he monitored the Garcia Area, north of Los Alamos. Since moving to Santa Fe several years ago, he watches sites on the Caja del Rio. He also enjoys the petroglyph volunteering immensely and often talks to his friends and colleagues about what the survey teams find on Mesa Prieta. It is in this respect that we know Bob best. He first trained as a petroglyph recorder in 2009 and was active on a recording team for about a year. Then his interest shifted to the activities of the survey teams that offer more strenuous activity. The RATs (Rock Art Trekkers) walk an entire 20-acre provenience in one day rather than the slower and more focused pace of the recording teams. Bob is also a consistent participant in trail maintenance days on the Wells Petroglyph Preserve and helps with removing barbed wire, clearing brush, carrying straw bales and wattles as well as trail construction. In May of 2012, he trained as a tour docent on the Preserve and has been extremely responsive to Paula's, and now Jane Clements', emails pleading for docents. In 2013 so far, Bob has contributed 32 hours, frequently signing on at the last minute when needed. Always sunny, always dependable, Bob has been a wonderful addition to our cadre of docents. quest of rock images on Mesa Prieta. forthcoming recording teams who follow you." leadership for all MPPP activities.